Students from the district's new entrepreneurship high school are already making their mark as innovators. Three teams from the Phillip J. Patiño School of Entrepreneurship were the only non-college students to make it to the finals of the Silicon Valley Innovation Challenge at San Jose State University late last year. And two of the teams won awards. "I felt like we earned our way there and proved we could compete on the college level," said junior Tayllor Lawson. "Seeing other people's excitement in our product makes me believe more in what we are creating." Tayllor, Maquela Halloway, Danhya Jimenez, Ashely Ruiz, Toni Celaya and Matthew Commins created Alleviate, a self-help anti-bullying app. They won the Best Social Innovation Award. Patiño's Derek Brown won the People's Choice Award for his Kool Breeze Solar Hat. Patiño's other finalists were Lillian Simmons, Kevin Quezadas, Taeyon Williams, Mark Porras, Yvette Robles, and Owen Levin on the Suvia team, a moisture sensing sprinkler system. 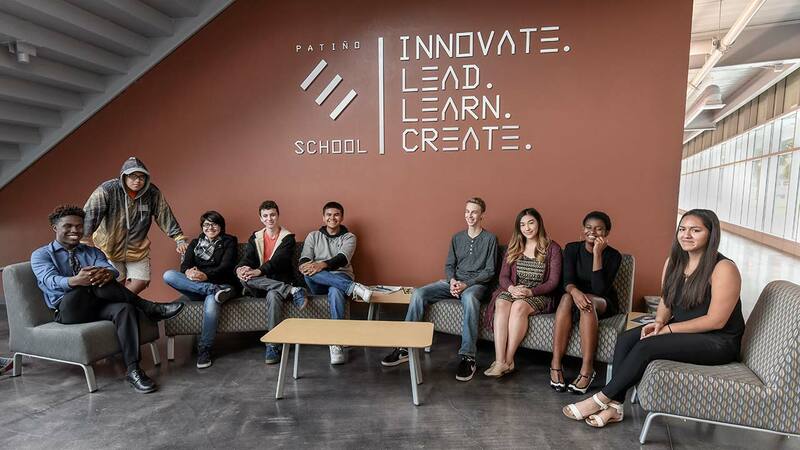 Patiño opened its doors in August 2015 its first group of students, 120 sophomores. This year, the school has juniors and another group of sophomores. Students attend their regional high school for their freshman year. Students are immersed in learning real-world business skills through the traditional course subjects of math, English, social studies, and science. At the same time, they are acquiring the academic, entrepreneurial and technological skills they will need for college and career. The curriculum connects students to their passions and provides real-world applications for what they are studying. Students meet regularly with mentors from the business community and develop and test new ideas, ultimately opening and running their own businesses their senior year of school. Students thought of the Alleviate app because many of them felt bullied growing up and wanted to create a resource that would help teenagers struggling through similar trials to connect to a community. The app evolved to support teenagers dealing with stress, depression, anxiety, negative body image, and low self-esteem. Additionally, they are seeking to connect teenagers to community resources like counseling. Many audience members and judges at the competition were inspired by team Alleviate and their app. In January, the Fresno Chamber of Commerce named Danhya as its High School Entrepreneur of the Year for her work with Alleviate. Derek Brown's family founded and runs Kool Breeze Solar Hat. The straw hat has a solar panel on top that powers an internal fan that cools the head. Each member of the family contributes to the company in a different way. Derek and his siblings are all part of the manufacturing team. Derek developed the Thurman hat design, one of three the company offers. The family was recently featured on CNBC's "Make Me a Millionaire Inventor." When Derek represented the family business at San Jose State, it was his ability to pitch and demonstrate his product that impressed the public and lead to him capturing the People's Choice Award. Team Suvia wanted to create a way to combat the recent drought in California. They created a lawn sensor that controls the amount of water distributed by sprinkler systems. Creating a working prototype, the team competed in the water technology category. People were impressed by the prototype Suvia created, and the team said they learned a lot about marketing and promoting their product through the competition. From the Nov. 15 competition in San Jose, Alleviate split a $1,000 award while Kool Breeze took home $500.